264 pages | 20 B/W Illus. "All too often books on comparative juvenile justice descend into bland description of powers and procedures. Goldson’s approach is refreshingly different and innovative. Taking an historically informed inter-national and intra-national approach, this edited collection opens up a rich and detailed analysis of key contemporary thematics. 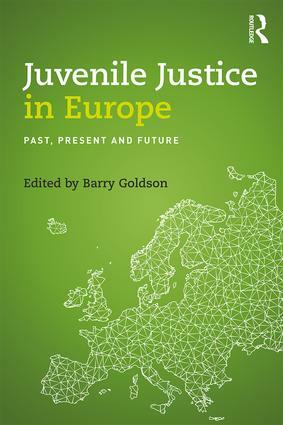 Goldson skilfully brings together the insights of leading analysts from across Europe to deliver the most critically informed and perceptive work produced on European juvenile justice to date." "This book offers a vital, timely and highly original analysis of juvenile justice in Europe at a time of profound changes and challenges. It is essential reading." Barry Goldson holds the Charles Booth Chair of Social Science at theUniversity of Liverpool. He is also Visiting Professorial Research Fellow at the Faculty of Law, University of New South Wales, Sydney, Professorial Fellow in Social Science at Liverpool Hope University and Adjunct Professor at the School of Justice, QUT, Brisbane. He is co-chair of the European Society of Criminology Thematic Working Group on Juvenile Justice. He has recently been awared the 'Juvenile Justice Without Borders' International Award in recognition for his research and work within the field of juvenile justice.